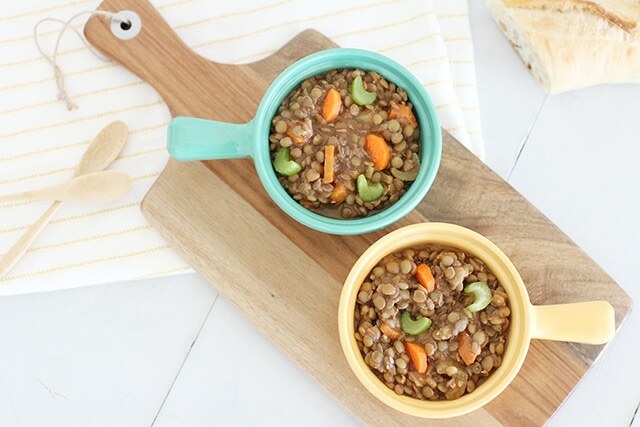 This hearty lentil soup is loaded with veggies and has an amazing texture and flavor kids will love! What Type of Lentils Should You Use for Soup? Brown Lentils: This is the most common variety. If you see these in the grocery store and the package just says ‘lentils’ it is most likely brown lentils. They have a mild earthy flavor. These work well in soups, stews, and veggie burgers. Green Lentils: These are similar to brown lentils but have more flavor – slightly peppery. They retain their shape well and with their stronger flavor they are good in salads and side dishes. Red and Yellow Lentils: These come in a range of colors and are sold ‘split’ which is smaller pieces of lentils. They are sweet and nutty and are common in Indian and middle Eastern dishes. 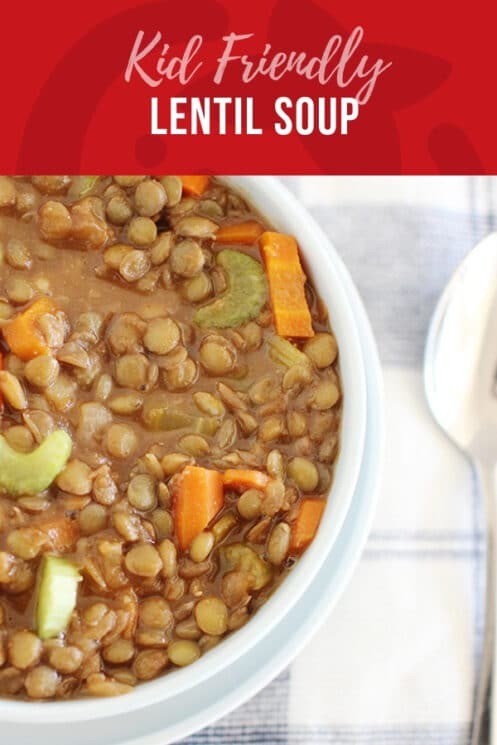 Because they are split and break down more than other lentils, they are really good in soups and stews, and casseroles and can act as a thickener. These cook faster than brown and green lentils and so should be added when there is 15-30 minutes left in the cooking time. Specialty Lentils: These are typically a lot smaller than other types of lentils. They have an earthy flavor and are very beautiful and so are a great base for salads or as a side dish with a protein. Lentils come in both canned and dried. The canned version is great if you need a quick side dish or salad. 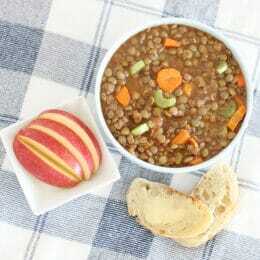 If you are making lentil soup or stew, you will definitely want to use the dried version. You don’t need to soak lentils before cooking them, but you will want to rinse them. Dried lentils can cook in less than an hour. They don’t need to absorb all of the cooking liquid like rice. You may want to test them during the cooking process to determine how you like them cooked. 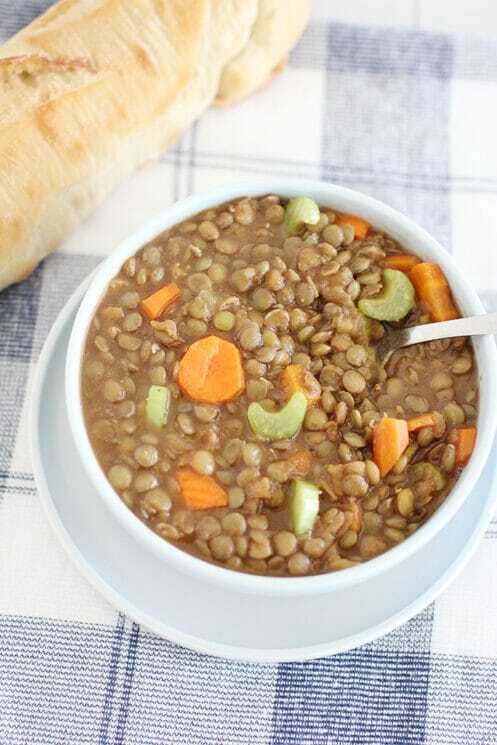 How Do You Make Healthy Lentil Soup? A good lentil soup starts with a good base. Onion, carrots and celery all sauteed to bring out the flavors. Use fresh spices – this recipe uses cumin and you want to make sure that flavor is well represented. 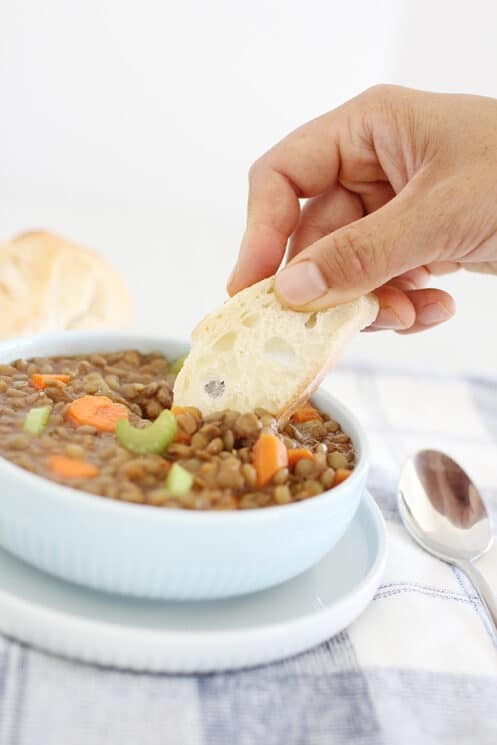 If you want a thicker and creamier lentil soup, blend some of it and then pour back into the soup. Lentil soup is SO good the next day! Place a large skillet over medium heat. When the pan is hot, add the oil and swirl to coat the pan. Add the diced veggies and cumin. Cook, stirring occasionally, for about 10 minutes, or until slightly softened. Add the lentils and vegetable stock. Bring to a boil, then turn the heat all the way down to the lowest possible setting. Partially cover, and simmer gently for 15-20 minutes, or until the lentils are completely soft. Add salt, pepper, and tomato paste; stir well. Taste for seasoning, and add more if necessary. So easy to make and so good!!! Everyone in the family loves it! I’m so glad to hear it, thanks Stephanie!